It has been a while since I have posted, but it has been a little crazy the last few months. I have been trying to adjust to working and having the kids in school. How I miss the homeschooling days! An upcoming post will be on packing school lunches, which has turned out to be a challenge. I have also been trying to work with an even tighter grocery budget. The job that my husband was offered fell through, so now we have more bills and less money. I have faith that it will all work out, but the waiting is hard. I know that God will provide and that a better opportunity will come about. Honey Mustard tempeh is a quick and cheap dinner that turned out to be delicious. 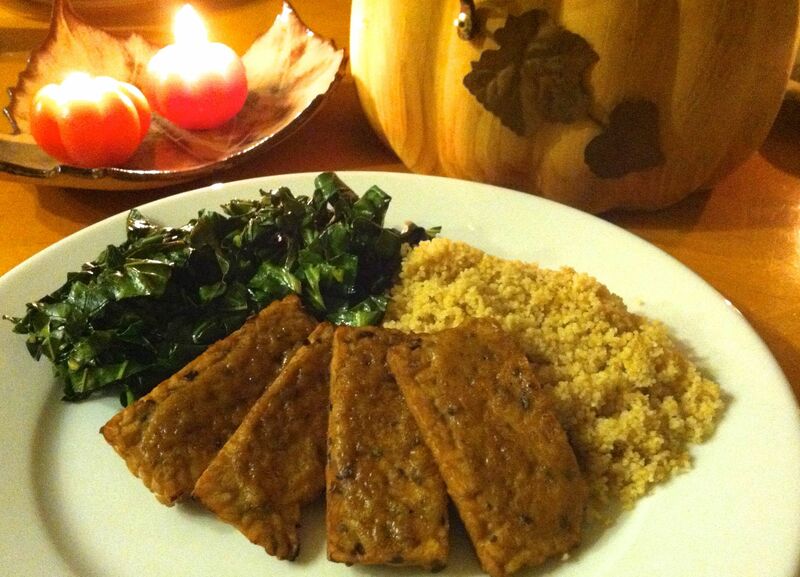 Tempeh is a great source of protein and it is so yummy. The key is to boil the tempeh before cooking with it. I boil mine in a marinade instead of just plain water (recipe follows). It gives the tempeh a great flavor and then you can use it for anything, even just for sandwiches. Cut the block of tempeh into 4 slices then cut the slices in half to make 8 thin slices. Boil the tempeh in the marinade for at least 10 minutes. Combine the mustard and honey, set aside. Preheat the broiler. Remove the tempeh from the marinade and place on a lightly greased sheet pan. Broil the tempeh on high about 8 minutes on the first side until it is browned (keep an eye on it). Fill it over and broil about 5 more minutes. Take the tempeh out of the oven, spoon a little of the honey mustard on each slice and spread it into an even layer. Return to pan to the oven and broil the tempeh for a few more minutes. You just want to topping to brown a little, but it can burn quickly so watch it. Remove from the oven. You can serve it hot or cold, it is delicious either way. Combine all the ingredients in a sauce pan and bring to a boil. Add in tempeh and simmer for a least 10 minutes. You can always let it go longer for more flavor. This marinade can be strained and then frozen after one use to use one more time. Just make sure to bring it back up to a boil again.